Sunday School Teachers are hired usually by churches to organize and teach Sunday school classes. The roles and responsibilities listed on the Sunday School Teacher Resume include – teaching Bible lessons, explaining verses in simple manner, inculcating reading habit among kids, addressing student needs, giving homework, maintaining attendance record, disciplining the attendants towards spiritual progress, leading every attendee to find more than one area of service within the church, preparing lessons which will capture interest, examining the truth of the passage and applying those truth to attendees’ lives. A Qualified Sunday School Teacher does more than just teaching a lesson, and hence these skills will be expected of them – a very good and thorough knowledge of the Bible, teaching aptitude, the ability to deliver lesson or lecture in front of different age-groups, being an active Church member, strong communication, and motivational skills. Applicants for this role come from varying educational backgrounds and commonly have a Bachelor’s or Associate’s degree in the relevant field. 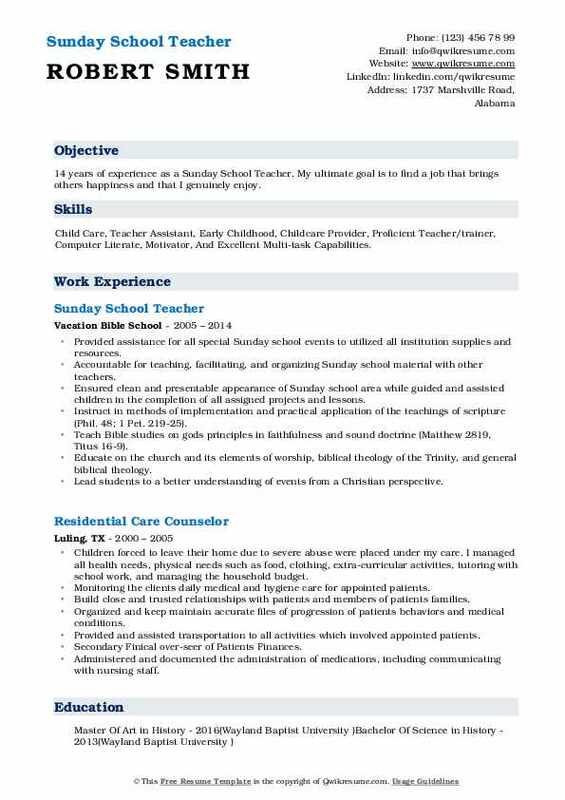 Summary : 12 years of experience as a Sunday School Teacher with strong leadership and customer service skills. I can build and maintain professional relationships and connections. A detail oriented, have strong ethics, and a superb record of company and client support, along with great satisfaction. 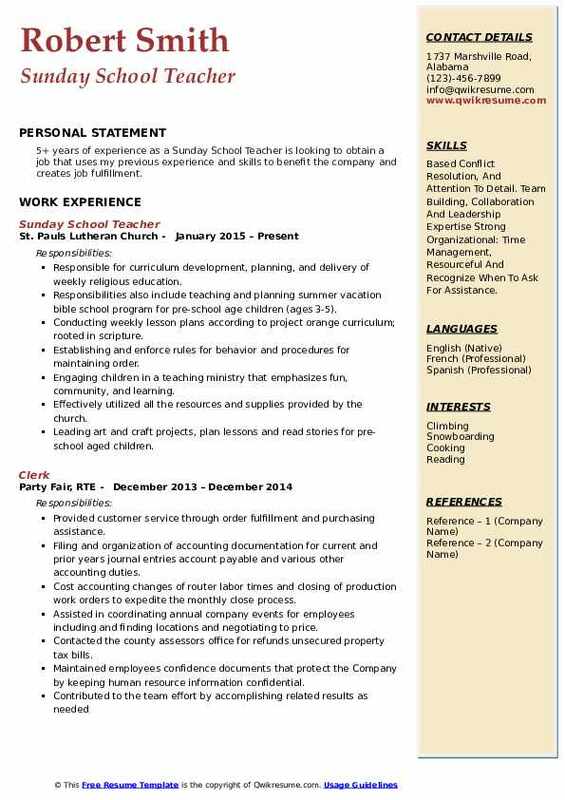 Skills : Microsoft Word, Powerpoint, Filing, Typing, Teaching, Customer Service, Sales, Outlook, People Soft, Transcripts, EDDI, Moodle, And Google Docs. Plans and prepares in advance for individual and small group bible-learning experiences. Visits, contacts, and ministers to preschoolers and their families assigned for ministry. Participates in prospect discovery, outreach activities, witnessing, and ministry. Prepares in advance, arrives on time, and evaluates and participates in age-appropriate bible teaching. Responsible for children's safety and care until released to appropriate guardians. Supervised and guided children in completing assigned lessons and projects. Planned and developed weekly lesson plans; assist with special events related to the Sunday school. Summary : Experienced youth counselor and sports coach with 12 years of experience as a Sunday School Teacher are seeking a part-time tutoring position for middle and high school-aged students. 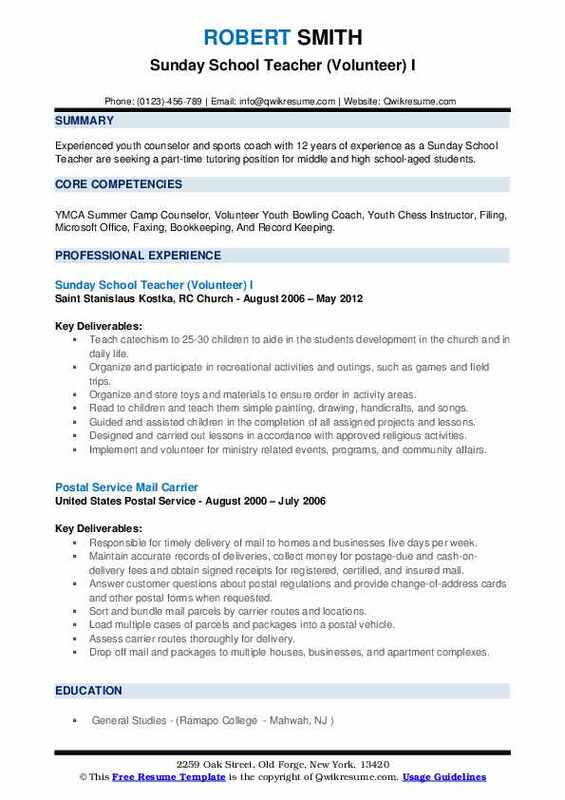 Skills : YMCA Summer Camp Counselor, Volunteer Youth Bowling Coach, Youth Chess Instructor, Filing, Microsoft Office, Faxing, Bookkeeping, And Record Keeping. Teach catechism to 25-30 children to aide in the students' development in the church and in daily life. Guided and assisted children in the completion of all assigned projects and lessons. Designed and carried out lessons in accordance with approved religious activities. Implement and volunteer for ministry related events, programs, and community affairs. Summary : 14+ years of experience as a Sunday School Teacher. I am confident and seek responsibility, looking to better myself by attending college and receiving my Associates Degree by July of this year. Taking the MS classes at the base education center to further improve my knowledge of the programs. The reliable and friendly Team member who quickly learns and masters new concepts and skills. Skills : Filing, Microsoft Office, Faxing, Bookkeeping, Record Keeping, Office Management, Team Work, MS Office/Word/Excel, Google Docs, And Web. Creating a curriculum for the students and have it approved by the church. For the projects that I have implemented, I have to ensure and order all craft and art supplies for my class. Learning a different style of teaching and talking to the parents about the welfare and spiritual growth. Working with pre-k through 2nd-grade students through the church. Supervising children, teaching through play, crafts, and other fun ways about the bible. I also have done summer bible school programs with them. In addition, I am on the youth joint task force through the church and we are responsible for organizing different events for the children in our area. Summarizing work completion and student evaluations with emphasis on providing feedback. Objective : 4 years of experience as a Sunday School Teacher. Engaging, professional, and mindful communication style Self-motivated, extremely resilient and adaptive Excellent problem solving and decision-making capabilities Passionate and motivated, with a drive for excellence. Several years as a stay at home mom and wife have given me the tools and experience in handling childcare needs. Enforce rules for behavior and procedures for maintaining order among a class of 20. Work with students on an individual and small group basis to reinforce learning. Implemented student discipline measures, decreasing classroom disruptions. Combined discipline plan with effective measures and various lesson plans to increase concentration, participation, and progress in student accountability. Earned positive verbal feedback from parents regarding classroom instruction and student learning success. Manage classroom and assist students with academic inquiries relative to teachings. Provide an opportunity for the salvation of each pupil and the subsequent maturation in Christ. Summary : 11+ years of experience as a Sunday School Teacher. Ability to manage multiple tasks and work well under pressure Responsible driver Mindful of individual child's needs Positive friendly Outgoing attitude Ability to work independently or on a team Time management skills / Organized. 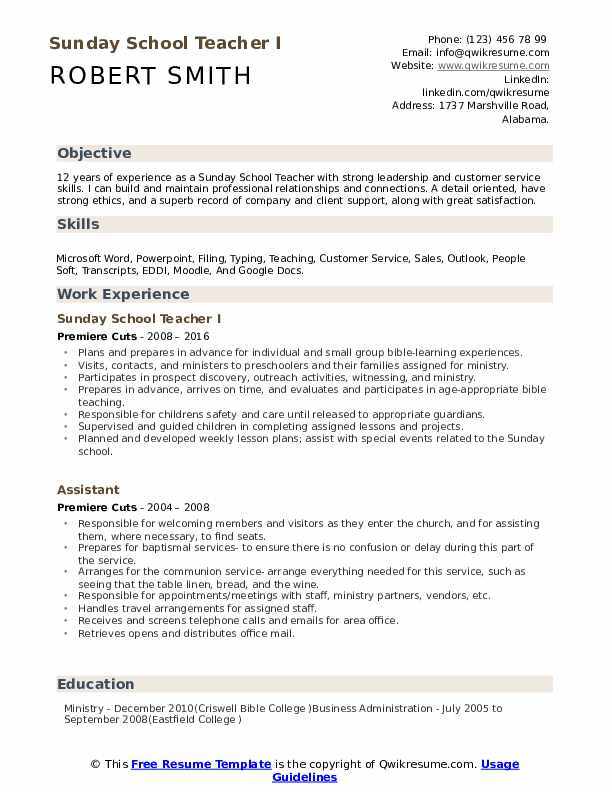 Skills : Teaching, Office Applications, Communications, Team Work, MS Office/Word/Excel, Google Docs, Web And Social, Interpersonal Communications, And Customer Service. Designing Sunday school lessons for the upcoming week to teach and equip students to be able to review and demonstrate a prepared lesson. Creating a welcoming environment to teach and admonish pre-teens and teenagers to grow in wisdom and become productive adults in society. Communicating with parents regarding students learning experience and if any disciplinary actions have been administered. Conducting a learning session appropriate to the needs and understanding of the pupils. Arriving a minimum of 15 minutes before the announced starting time for Sunday school to arrange materials and greet pupils. Maintaining a safe and playful environment for the children, also keeping up with attendance and safety involving the children such as allergies, first aid and so on. Responsible for putting lessons together, teaching the class, creating activities and crafts for the children to complete. Summary : 14 years of experience as a Sunday School Teacher. My ultimate goal is to find a job that brings others happiness and that I genuinely enjoy. 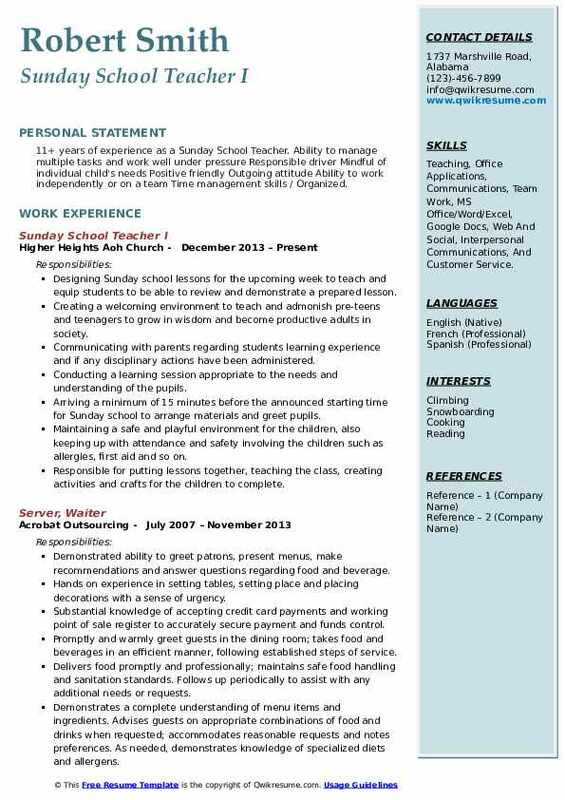 Skills : Child Care, Teacher Assistant, Early Childhood, Childcare Provider, Proficient Teacher/trainer, Computer Literate, Motivator, And Excellent Multi-task Capabilities. Provided assistance for all special Sunday school events to utilized all institution supplies and resources. Accountable for teaching, facilitating, and organizing Sunday school material with other teachers. Ensured clean and presentable appearance of Sunday school area while guided and assisted children in the completion of all assigned projects and lessons. Instruct in methods of implementation and practical application of the teachings of scripture (Phil. 4:8; 1 Pet. 2:19-25). Teach Bible studies on gods principles in faithfulness and sound doctrine (Matthew 28:19, Titus 1:6-9). Educate on the church and its elements of worship, biblical theology of the Trinity, and general biblical theology. Lead students to a better understanding of events from a Christian perspective. Headline : 5+ years of experience as a Sunday School Teacher. Communicates professionally and pleasantly with patients and co-workers. Compassionate and courteous and interested in others. Maintains patient confidentiality. Adapts quickly to change and enjoys challenges. Able to take medical histories Able to take vital signs Strong writing and communications skills. 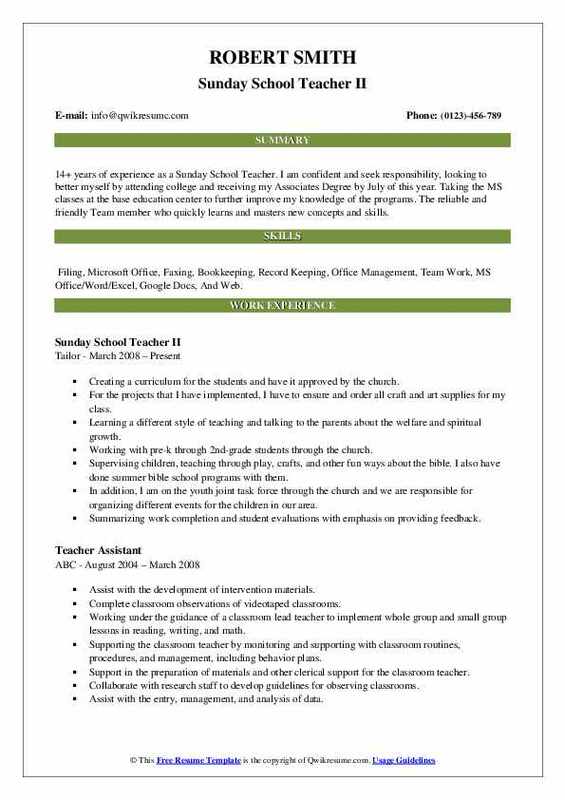 Skills : Elementary School Teacher, Administrative And Management, Team Work, MS Office/Word/Excel, Google Docs, Web And Social, Interpersonal Communications, Customer Service And Sales, And Proven Leader. Preparing weekly bible lesson plans and material for class activities; manage the classroom. Nurturing children's spiritual growth and transformation in cooperation with their parents, and the rest of the church community. Engaging with children and encouraging children to try and challenge there self in reading the writing. Not only do I work with kids I teach and carefully explain the activity. Responsible for putting together educational curriculum and videos for children to watch and also games for the children to be a part3 of and learn from. Preparing youth-oriented lessons and activities throughout the week using available online materials and personal experiences. Many lessons are inspired by everyday objects and events not found through other sources. Providing an opportunity for the salvation of each pupil and the subsequent maturation in Christ. 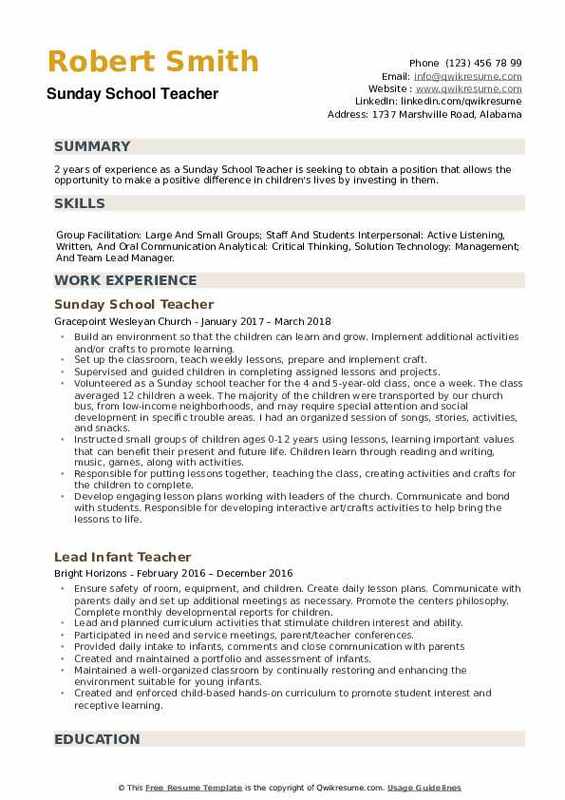 Summary : 8+ years of experience as a Sunday School Teacher is looking to work in a preschool environment with seasoned teachers to gain experience and knowledge about working in the field, so I can bring my passion for education to young children every day. Skills : MS Office 2010, PowerPoint, Sign Language, Customer Service And Sales, Proven Leader, Procurement, Scheduling, Inventory Management, Telephone Etiquette, Focused And Responsible. Creating weekly lesson plans and activities. Physically and verbally interact with children ages 4-5. Nutritious snacks for the children. Collaborate with co-teacher for ideas and lesson plans. Leading a small group of children in an effort to team up with the home to cultivate an environment conducive to spiritual growth. Working in a team environment in order to effectively and creatively communicate biblically. Following through the provided monthly lesson curriculum each week. Ensure the safety of the children and create a loving. Organizing and lead craft activities that allow students to explore the subject area in more detail. Providing instruction to preschoolers using prepared biblical lesson plans which include storytelling, skits, and songs. 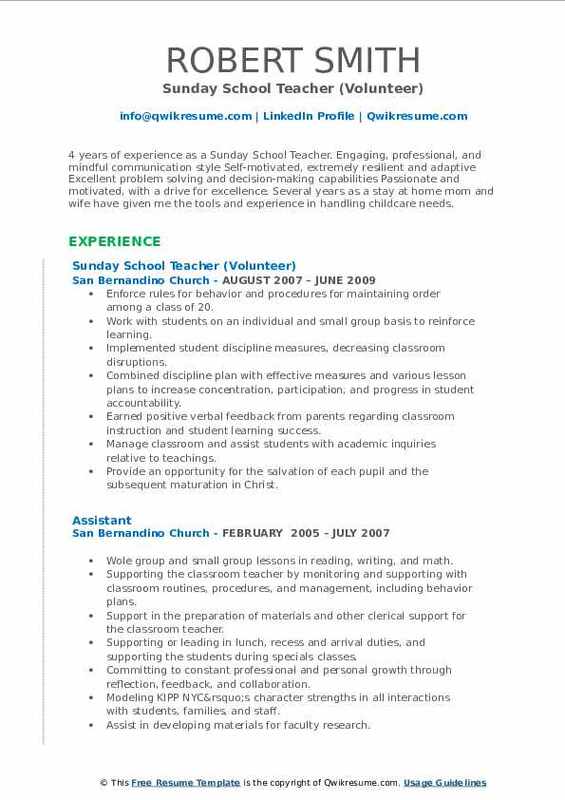 Headline : 5+ years of experience as a Sunday School Teacher is looking to obtain a job that uses my previous experience and skills to benefit the company and creates job fulfillment. Skills : Based Conflict Resolution, And Attention To Detail. Team Building, Collaboration And Leadership Expertise Strong Organizational: Time Management, Resourceful And Recognize When To Ask For Assistance. 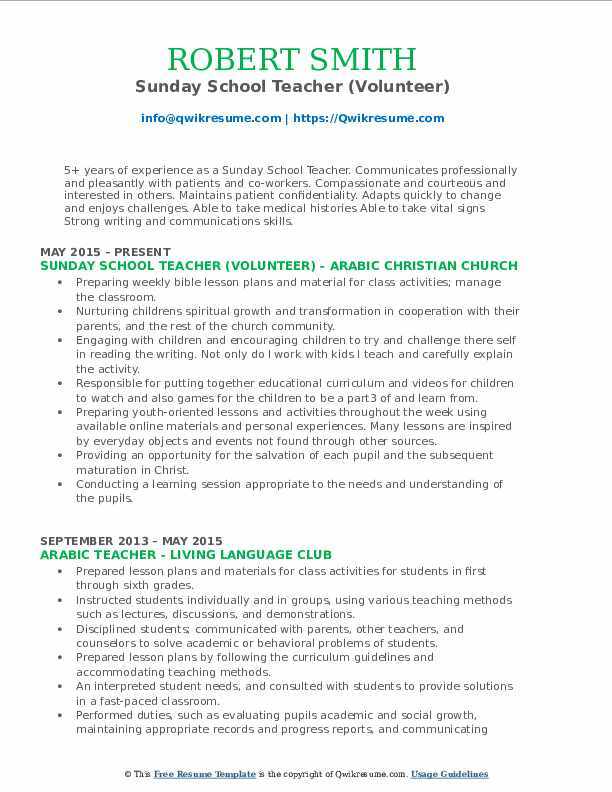 Responsible for curriculum development, planning, and delivery of weekly religious education. Responsibilities also include teaching and planning summer vacation bible school program for pre-school age children (ages 3-5). Conducting weekly lesson plans according to project orange curriculum; rooted in scripture. Establishing and enforce rules for behavior and procedures for maintaining order. Engaging children in a teaching ministry that emphasizes fun, community, and learning. Effectively utilized all the resources and supplies provided by the church. Leading art and craft projects, plan lessons and read stories for pre-school aged children. 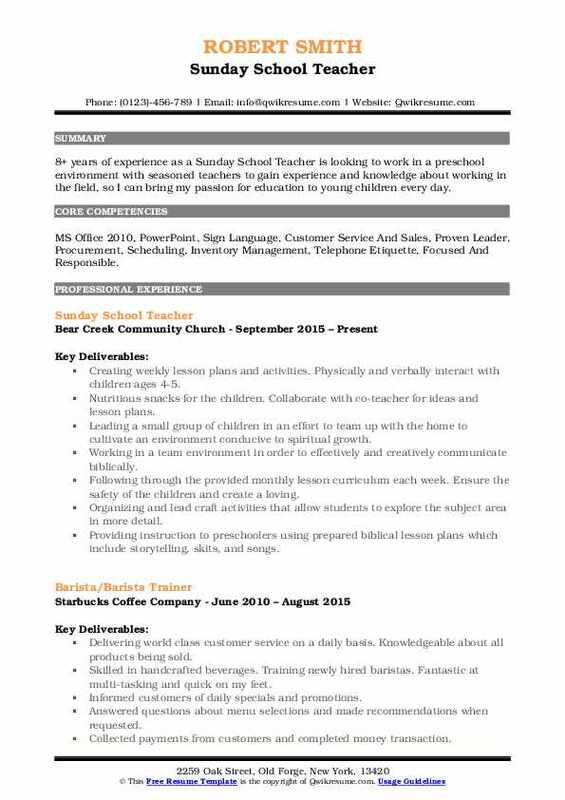 Objective : 2 years of experience as a Sunday School Teacher is seeking to obtain a position that allows the opportunity to make a positive difference in children's lives by investing in them. Skills : Group Facilitation: Large And Small Groups; Staff And Students Interpersonal: Active Listening, Written, And Oral Communication Analytical: Critical Thinking, Solution Technology: Management; And Team Lead Manager. Build an environment so that the children can learn and grow. Implement additional activities and/or crafts to promote learning. Set up the classroom, teach weekly lessons, prepare and implement craft. Volunteered as a Sunday school teacher for the 4 and 5-year-old class, once a week. The class averaged 12 children a week. The majority of the children were transported by our church bus, from low-income neighborhoods, and may require special attention and social development in specific trouble areas. I had an organized session of songs, stories, activities, and snacks. Instructed small groups of children ages 0-12 years using lessons, learning important values that can benefit their present and future life. Children learn through reading and writing, music, games, along with activities. Develop engaging lesson plans working with leaders of the church. Communicate and bond with students. Responsible for developing interactive art/crafts activities to help bring the lessons to life.